At least according to the new social site, Vizify in its analysis of my year on Twitter. It says I tweeted 3,200 times since April 2011. This will be my 11,897th tweet of this post. I confess, I do like Twitter. It is a powerful communication, amplification, and connection tool. 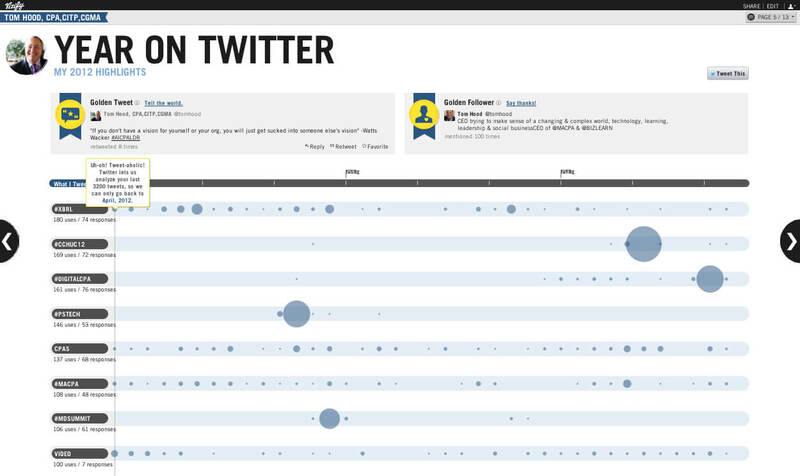 I use it as a filter for all of the major news and events I need to keep up with, a curation tool for links and insights from my friends, and based on this Vizify analysis, it is a major part of my PLN (Personal Learning Network). You will see the major tweet streams, including several of my favorite conferences where I tweet to learn and share my insights. In fact, many members have thanked me, saying that they feel like they are attending several conferences a year due to my tweets (and those of my trusty colleague, Bill Sheridan). These become notebooks from the events that I use to write blog posts and recaps. Twitter is also how we take care of our sponsors. At our MACPA Innovation Summit, we had over 150,000 impressions from RTs that made the reach way beyond the attendees. That is additional exposure and value! So, why do you tweet? Or why not?